Chris Shaw/Jolly Roger speaks at the labor action against Jam Productions on Wednesday . 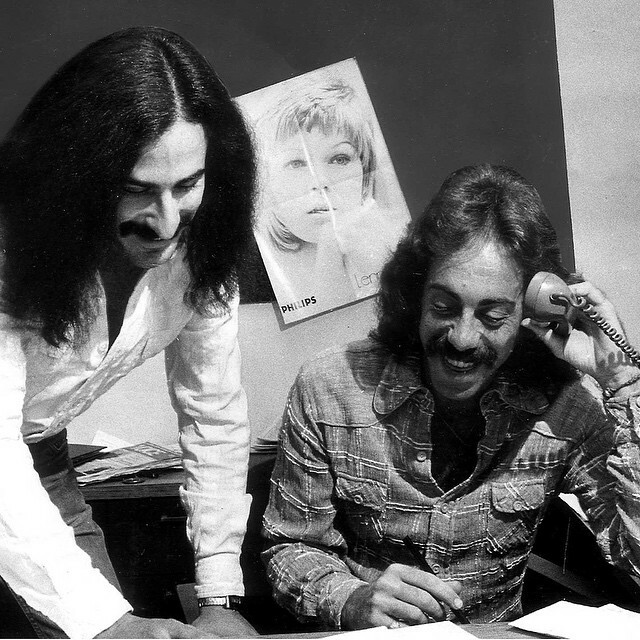 Jam's Jerry Mickelson and Arny Granat at the start of their concerts career . A hulking but gentle giant of a man, Chris Shaw has worked for Chicago concert promoters Jam Productions for 37 years. Most recently the crew chief and supervisor of stagehands at the Riviera Theatre in Uptown, he’s a familiar face to generations of local music lovers, standing in the shadows just offstage, or joking with concertgoers before the start of a show. Most, however, know him by his more fitting nom de rock: Jolly Roger. The picketing stagehands were flanked on Wednesday by supporters including former Gov. Pat Quinn, members of the “faith labor action” group Arise Chicago, and the ubiquitous union-busting inflatable rat, which has acquired a new name in this battle, as explained below. The protest received extensive coverage—from The Chicago Tribune, The Chicago Reader, and WBEZ, among other outlets—but the labor-rally rhetoric glossed over the specific issues in the fight, as well as obscuring the bigger context of the live music business in Chicago at present. Founded four decades ago by two hustling young concert promoters, Jerry Mickelson and Arny Granat, Jam for years was the sometimes bullying dominant force on the local concert scene. That changed in the mid-’90s with the ascent of Clear Channel, later renamed Live Nation, the monopolistic Hollywood-based global giant that, as documented in one brutal court battle, announced its intention to “crush, kill, and destroy” Jam, as it has many other independent local promoters across the U.S. Now merged with Ticketmaster as well as Texas-based C3 Presents, the company behind Lollapalooza, Live Nation has slowly but surely limited Jam’s share of the concert business to mid-size theater shows. On that level, Jam still reigns supreme in Chicago—though the labor battle may erode its control there, too. Q. Jolly, the first question I’ve had is why, after years of working for Jam without union representation, this is happening now? Q. There comes a time when you don’t want to haul road cases any more? Q. I know what you mean: I did a story years ago about the stagehands working a Pantera show at the old World Music Theater, and it was dawn until… well, the next dawn! Q. I hadn’t realized that Jam lost the Aragon. Q. When did that go down? Q. That story has been way under the radar. Q. The whole concert business used to be a lot different: It was the Wild West, but now it’s as corporate as Walmart or Microsoft. Q. I’m assuming that most Live Nation shows and C3’s Lollapalooza are union gigs? A. “Yes. So the discussions went down, people started talking about it, and at first it started out with a bunch of guys. I went with them to a meeting—it might have been the second meeting, it might have been the third—and I talked with a guy, Craig Carlson, who’s the head of the union. He’s a guy I’ve known literally for 30 years. We talked, and I said, ‘You know, fellas, this is good for the younger guys, but I think I wanna stay with the company.’ And they said, ‘We can understand that, Jolly. You’ve been with those guys a long time.’ Then the next thing I know, we all got fired! “What had happened is some of the fellas were having things signed—the cards to take a vote [to unionize]—and we hadn’t even gotten to vote when suddenly I got a call from Jerry [Mickelson]: ‘We’ve decided to go in a different direction.’ After 30 years, Jerry? What are you talking about? If something had gone wrong or was going wrong, they should come to people and say, ‘Hey, quit doing this’ or ‘Don’t pick your nose in front of the artists.’ Whatever. But there was none of that, there was just: ‘BOOM! You’re fired.’ They were like, ‘Why didn’t you tell us there was a problem? All you do is complain.’ And I was telling them there were problems for the last five years! But this has led to where we are now. Q. You said “problems.” What kind of problems? Q. So Live Nation gigs pay $35 an hour? Q. A lot of people covering the story have missed the bigger context. You know my work: I’ve been covering Jam since I arrived in Chicago in 1992. When I got here, they were the 800-pound gorilla, really tough businessmen, and it never seemed as if they’d look like the smaller “good guys.” Now, doing battle with the big corporations of Live Nation/Ticketmaster and C3 Presents, they’re the hometown alternative. They generally treat concertgoers much better, but Chicagoans know where to go when they have a complaint: Jam’s office is right there on Goethe Street. In comparison, you can’t even find a phone listing for Live Nation, and C3 is in Texas. People see Jerry Mickelson and his partner Arny Granat at shows all the time; they know them and talk to them, they thank them and gripe at them. Now, Jerry has always been mercurial, but this fight seems downright boneheaded. Why would he shoot himself in the foot with such bad publicity? A. “I just think he doesn’t understand the current climate. The current climate, since I became involved, I went to Craig and the other people at the union, and I said, ‘These buildings can’t support the $40 or $50 an hour that the union calls the local standard. These buildings can’t support triple time on Sunday nights. The wages shouldn’t change that much.’ But having said that, there should be some avenue for health insurance, there should be some avenue for some type of retirement fund, there should be some avenue for raises and for education. These are all things that fellows from the union have offered us, and they’ve followed through with them, because at least five of our guys have taken certification tests. Three are going through the classes now and they’re going to take the test soon, and two of them already took the test since this has been going on in the last month. I just know that a lot of the other people are going to get a good opportunity if they mind their p’s and q’s, and by that I mean show up on time, don’t drink, don’t be a jerk, and work hard. Then they’re gonna get what they should get. Q. You say the smaller venues Jam owns—the Riviera and Vic theaters and the Park West—cannot pay the same hourly rates that Live Nation’s bigger buildings pay. You know the argument from the Jam side, if or when they talk, is going to be that unionizing means ticket prices will go through the roof, and Jam might not even be able to stay in business. A. “Yeah, but concert ticket prices have already gone way through the roof! That’s part of the point the fellas have brought up over and over again. I have a ticket here from when I was with Ozzy [Osbourne] where it was $8 in advance and $9 for day of show. That’s the ‘Diary of a Madman’ tour, which isn’t a century ago. [The tour was 1981-82.] So ticket prices have skyrocketed, and most of that is due to bands thinking of new ways to do things and the V.I.P. tickets that they sell, all these things they’ve come up with. But the guys that aren’t getting any benefit from really doing a lot of the work are the guys on the stage. Q. Let me continue to play the devil’s advocate: Can this fight lead to Jam being squeezed out of the business and Chicago becoming a Live Nation-dominated town like most others in America? Q. Where do the other Jam employees stand—all of the talent bookers, the marketing folks, and the office staffers? Q. What about Jam co-founder Arny Granat? Where does he stand? A. “I haven’t talked to Arny; I don’t know. I would have thought he would have called me, but he hasn’t, so that’s where it sits. I did see him at AC/DC. He’s always been a nice guy to me. He’s a business man, but he’s always been nice to me, and when something came up that maybe he didn’t like, he’d always come to me and say, ‘Listen, this is how it has to be.’ But for Jerry to just say, ‘Listen, we’re going in a different direction, you guys are all fired….’ Listen, there was some drama going on between a couple of people, but it wasn’t me, but they’re saying it was me. Q. They’ve positioned you as the ringleader—the Joe Hill? Q. Back to the big picture, Jolly: Can Jam come back from this and be the local company that Chicagoans have been supporting for 40 years? Q. For a union agitator, you’re sounding eminently reasonable. A. “I’d like to think I’m the same as I’ve always been, but sometimes, the devil come out! Q. That has never been something Live Nation or C3 would say. Q. That was almost poetic, Jolly.